Over the past several decades, anthropogenic effects (human activity) are increasingly tipping the balance in favour of some species over others in North America; and heavily one-sided dominant forms of competition between species have the potential to explain global declines in species’ populations and reduced global diversity. With agricultural intensification, land development, and human waste management, some species flexible to changing landscapes are likely influencing their community structure through disproportional abundance, which allows them to compete more aggressively for space and food resources. Effects of both invasive species and disproportional growth in select species is a global concern and has been for several decades (Garrott et al. 1993). Invasive European Starling populations out compete other native birds for space and food resources. If you are a hunter, or an avian biologist then you definitely have hard or seen first hand the exponential population increases in North American Lesser Snow Geese. Flocks of millions of birds move through the mid-continent twice a year either heading to or away from their arctic tundra breeding grounds. Biologists have been monitoring this growth pattern and implementing game management strategies. 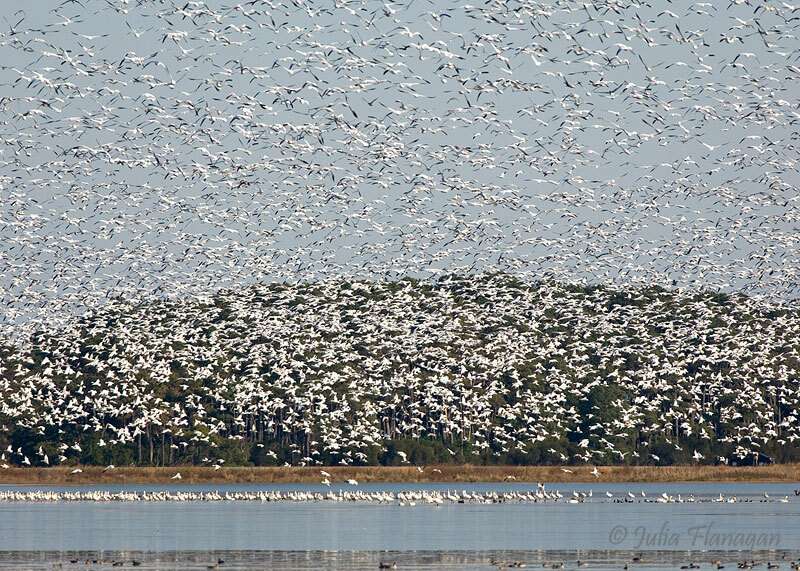 Snow geese population numbers cannot increase to infinity obviously. At some point something has to give; habitat space, food resources, disease, or a combination of those things. For the past few years I’ve been interested in seeing how the snow goose populations are changing and projected to change based on research by a number of fantastic goose biologists in both Canada and the USA. A couple weeks ago, I received an email from a fellow biologist whom is heavily immersed in the game management and hunting community. An American-based hunting outfitter had contacted him regarding several dead fully intact snow geese found in an open field. Over several days ~50 birds were seen dead, many with a mucous coming from their nostrils. This hunting trip was located in Saskatchewan for the spring hunt. Long story short and a long email thread later, I had contacted one goose biologist, who contacted multiple other biologists and a Curator at the University of Saskatoon was interested in receiving the dead carcasses for inspection and testing. This outfitter company graciously delivered the birds to the University. As it turns out, these dead birds were confirmed for Cholera. This is an unusual and rare appearance of this lethal disease in this species and particularly in Canada. As populations grow, densities of colony species or socially aggregate species effectively can transmit disease between each other or get infected through common sources of water or food. As a biologist, this finding was exciting. And I quickly realized the power of a network within our avian community. Once the formal report for this disease comes out, I will provide the link here.